David Lertis Matson is a native southern Californian who joined the faculty of Hope International University (formerly Pacific Christian College) in August 2004. Prior to this appointment, he served as Minister of the Westwood Hills Christian Church in Los Angeles (1999-2003) and as Assistant Professor of Bible at Milligan College in Johnson City, Tennessee (1995-1999). He has a deep and abiding passion for teaching the scriptures and for injecting biblical scholarship into the life and ministry of the church. 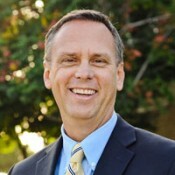 Matson holds the Doctor of Philosophy degree in Religion (Biblical Studies-New Testament) from Baylor University, the Master of Arts degree in Religion (Biblical Studies) from Pepperdine University, and the Bachelor of Arts degree in Biblical Studies/Preaching from Pacific Christian College of Hope International University. He has also studied at the University of California at Los Angeles and at Fuller Theological Seminary. The author of numerous articles and book reviews, Matson had his Household Conversion Narratives in Acts: Pattern and Interpretation included in the prestigious Journal for the Study of the New Testament dissertation series, published by Sheffield Academic Press. More recently, he co-edited and contributed to One in Christ Jesus: Essays on Early Christianity and ‘All that Jazz’ in Honor of S. Scott Bartchy. Matson has also served as adjunct professor at Fuller Theological Seminary and Pepperdine University. Matson has strong and historic ties to HIU. In addition to having three sisters who are also graduates of HIU, his great-grandfather, Earl G. Harris, grandfather, Lertis R. Ellett, and father, Donald L. Matson, each served terms on HIU’s Board of Trustees. His grandmother, Kathryn (Harris) Ellett, attended HIU (PBS) in the 1930’s. He truly considers them his legacy. Matson's classroom style can be aptly summarized by a placard he often brings to the first day of class: "I am subject to bursts of enthusiasm!" “Breaking the Bread, Breaking the Veil: Recognition of Jesus at Emmaus,” Leaven 3 (1995): 8-12.
Review of The Gospel according to Luke: Volume II (Luke 9:51–24), by Michael Wolter. Review of Biblical Literature April (2019). Review of Luke, by Alan J. Thompson. Review of Biblical Literature January (2019). “‘Put Your Sword Back into Its Place’ (Matt 26:52): The Rationale Behind Jesus’s Sword Directive (and It Isn’t Pacifism),” Stone-Campbell Journal National Conference, Knoxville, TN (2019).